Our luxurious Nottawasaga River Retreat (located in the Hockley Valley) offers a relaxing, rustic retreat, set into a beautiful woodland area with a deep valley at the foot of the back deck. 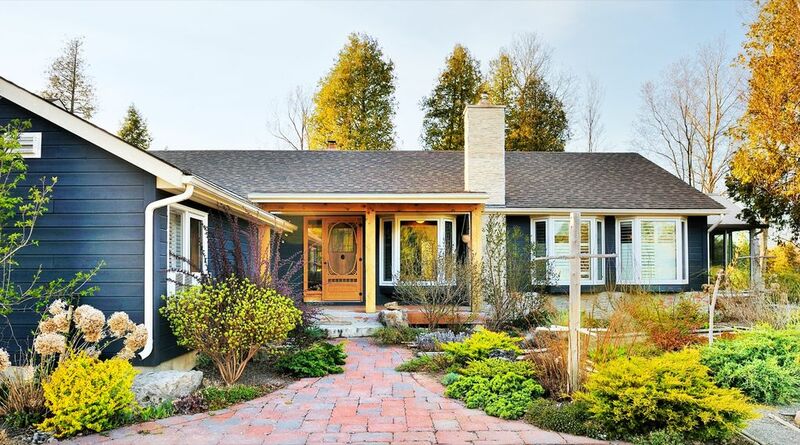 Just yards from the retreat lies the Nottawasaga River – a naturalist and trout fisherman’s paradise. The Notty (Nottawasaga River) runs directly through the boundaries of our 77 acre private, secluded, forested property. Enjoy our 5 bedroom modern beautiful home while you sit and watch the deer, pick berries or wade into the river and skip rocks on 'Pebble Beach'. The Nottawasaga River Retreat is perfect for quiet, relaxing family getaways. Home has wifi but no cable currently. All guests receive a 20% discount on all Spa Services. Appointments are required. My wife and I are family physicians 40 minutes south in the booming city of Brampton. We have 2 great kids - Omiya and Vyom who love coming down to 'pebble beach' at the cottage when we can make it down. This is our dream cottage - a modern home - bigger than we could ever use nestled in a forested are of 70+ acres with the Nottawasaga river running through it. The cottage is our way of teaching our kids to be in nature and get away from the city life. We had a wonderful time with family and friends. Michelle was very accommodating , whenever we needed something we could call her and she would help. We are reoccuring renters and love the property! Looking to book again in December and next year. Our group consisted of 5 Women and 3 toddlers. This is a very large house, which was perfect so the toddlers could make their noise at 6am and not wake up those sleeping in. It was one of the best stocked and clean cottages we have rented thus far i.e. there were lots of towels, kitchen had lots of supplies, etc. The river and grassy area were great for the toddlers to burn energy. I didn't book a massage but some of the others in our group did and thought it was fantastic. I second another reviewer that the furniture in the living room is sparse, we moved the second couch into the living room and that problem was solved though. Another kitchen chair or 2 would help for large groups (was just enough for the 8 of us). Check in/out was simple. We did not need any assistance from the property manager while there, but it was great there was someone available should we have needed help. This house is large with many bedrooms and two pull out couches. It is very nicely renovated and has everything you need for a nice weekend away. The property is very nice, with a fire pit and a beautiful creek (not deep enough for swimming, but we tried anyways!). Only complaint is that the furniture is sparse in the living room, this is really not a big deal, just something of note. The sun rooms on the property are so nice and make for a beautiful place to enjoy the scenery. Highly recommended! Also, check out the general store just down the road. It is very cute and a great place to grab breakfast. It also doubles as an LCBO if you run out of beverages...only a ten minute walk from the house! This cottage has space if you need it. A little minimalistic furniture wise but hey, it's a rental! The cottage is kind of close to main road but no noise is heard from within and the spectacular view and river behind make it worth it. We have just returned from a wonderful stay. This house is beautiful and very spacious; and even more so is the back yard! What great get-away for us! We rented the house from Thursday - Tuesday. We asked permission to host a family reunion/BBQ/celebration on Saturday. This was the PERFECT place to host. It's a short drive from Toronto; we grilled burgers on the large deck; plenty of parking; served beverages and cold food in the sunroom; we played games like soccer and bocci ball on the lower-level lawn in the back yard. We brought our own medium-sized canopy to provide shade for our guests on the lower-level lawn. At the end of the night, all the beds were full and there was ample space for us in the house. Once everyone departed on Sunday morning, my husband and I had the house to ourselves again. Our dog loved wading into the river and exploring the greenery. There's a General Store/LCBO at the end of the road where you can get last-minute items. And finally, George (the property manager) was so wonderful to work with. He answered all my questions via phone call/text in a timely manner. And he ensured the lawn was groomed for our BBQ. Our family and friends who came on Saturday loved the place so much that we're already talking about coming back! Thank you for having us! Thank you for your kind words. It was a real pleasure having you both stay at our home. Fantastic place. This cottage was one of the best equipped properties we have encountered. Three large bathrooms, with baths and separate showers, and a kitchen extremely well supplied with utensils etc. The open-plan living part on the main floor and the large windows allowed us to enjoy fantastic views from inside. Thanks to the property manager for a great stay and for such impeccable maintenance of the location. We have especially enjoyed the owner's prompt and helpful responses to our queries and willingness to accomodate all our needs. Located just 40 minutes north of Toronto International Airport, experience the peace, quiet of the wilderness just outside the city. Hockley Resort is a beautiful quaint country town - enjoy breathtaking views on scenic drives in the area. Please be aware that the portion of the Nottawasaga River that we're on is not suitable for boating or canoeing.